ONLY 10 BESPOKE PRINT SLOTS AVAILABLE! Once you have placed your order via the Bespoke Product page. 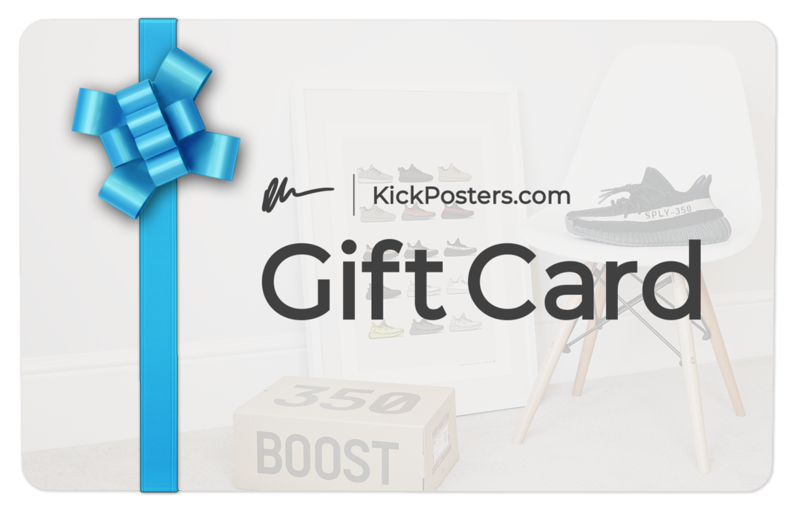 Please send profile/side on images of your chosen shoe(s) to bespoke@kickposters.com with "Bespoke" + your order number in the email 'subject' tab. If ordering the Triple Shoe (3 shoes) design please state which shoe you want at the top, middle and bottom. I will then design your print based off of your order and email, then print and ship it straight to your door. Once your order is received, I aim to design, print and ship your poster within 3 weeks (please bear this in mind when ordering for birthdays or special occasions). However, at this time I can only offer bespoke prints for Single Shoe (1 Shoe) or Triple Shoe (3 Shoes) designs. The more shoes on the poster the longer it takes me to design, and right now I can't commit to making bespoke prints with more than 3 shoes on, I don't have enough free time. Sorry.